Stephen Coonts has been hailed as the best contemporary author writing about flying. In The Cannibal Queen, he turns his storytelling genius to nonfiction with an exultant account of three glorious months in the summer of ‘91 spent in the cockpit of a 1942 Stearman vintage biplane. Joining the ranks of John Steinbeck and Charles Kuralt, Coonts takes us on an extraordinary adventure, touching down in all forty-eight of the continental United States. The Queen started life as a World War II primary trainer then spent over thirty years as an agricultural spray plane before being lovingly restored. For Coonts, who’s logged thousands of hours in the Navy’s most sophisticated aircraft, the Queen is flying as he’s never known it before—flying close the earth, the wind teasing his helmet, equipped with little more than a map and a compass. First stop is a Stearman fly-in in St. Francis, Kansas. there amid the barbecues and barber-shop quartets, the tree lined streets with their modest homes, Coonts feels nostalgia for small-town America, for a way of life he felt was dying. Yet, by the end of the journey, having met the friendly, richly individual people in towns large and small across the land, he knows our nation has weathered her first two hundred years remarkably well, and he is filled with hope for the future of this vast and varied land. 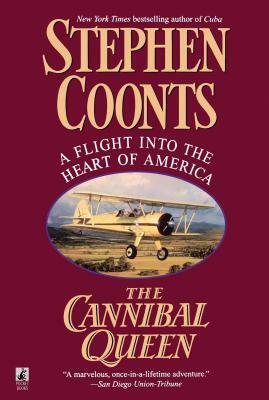 First published in 1992, The Cannibal Queen was Coonts’ first venture into nonfiction and is hailed today as a classic flying story. Coonts captures the joy and wonder of flight on every page. Over half the fan mail he has received through the years has been about this book. You owe it to yourself to go flying with Stephen Coonts. Stephen Coonts is the author of innumerable New York Times bestsellers, the first of which was the classic flying tale, Flight of the Intruder. Coonts grew up in the coal-mining town of Buckhannon, West Virginia, and served as a pilot in the Navy. He still enjoys flying and tries to do as much of it as possible. Find out more at Coonts.com. San Diego Union-Tribune A marvelous, once-in-a-lifetime adventure. Denver Post Coonts shares the thrill of his dream with his readers...and he weaves a delightful tapestry that shows us what our country really looks like...Like a balladeer of old, Coonts sings us a song of the awesome power of nature and the beauty of the country. We meet the friendly folk who run small-town airports and that peculiar breed of aviators who fly lovingly restored aeroplanes...Coonts' odyssey...thrills. New York Daily News Down to earth, above it all....The Cannibal Queen is a bird's eye view of small-town America, a detailed, upbeat journal with lots of airport shop-talk, and meditations on the joy of flight and solitude, and a lament for the despoiling of the environment. San Diego Union-Tribune What a pleasure to encounter a writer as eloquent about a consuming passion as Stephen Coonts is about aviation....None of his old fans will be disappointed, and he is sure to make a host of new friends with this account. Associated Press A paean to aviation and small-town life....Coonts' delight is palpable. Rocky Mountain News Coonts shares his passion....His account is that of a fellow in love with aircraft and at home in the sky. His writing style is friendly, frank and engaging....His views are outspoken and interesting....Coonts offers a good-humored account of an adventure very few pilots would even attempt. Chattanooga News-Free Press The Cannibal Queen is a pleasure, a delight to read....I thought many times that Coonts is a little like William F. Buckley, but he flies instead of sails....The book is a keeper. Sacramento Bee The Cannibal Queen opens a whole new world....This is a much different book from Flight of the Intruder or Under Siege, but it's likely Coonts fans will enjoy this real-life adventure as much as his novels. Chicago Tribune Enjoyable...breezily written...fun to read....A travelog of small-town America, a walk through American aviation history, a look at contemporary family life and a lot of stream-of-consciousness musings about everything from sailing to weather reports....The Cannibal Queen should have broad appeal....Coonts will leave his readers wanting more. Kirkus Reviews The culture of the private plane comes delightfully to life as Coonts marvels at a country where every little town has its strip, its laconic air controller, its cheap, clean motel just down the road....The descriptions of flight and the portrait of an America seemingly trapped in a time-warp are arresting.